Michael Heidler has again come up with a one-of-a-kind German firearm, and sent us this writeup. This time, it is an experimental variation on the MP38 submachine gun. Thanks, Michael! The submachine gun with serial number V3013 is kept in the outstanding collection of the Czechoslovak Military Museum in Prague (Vojenský historický ústav Praha). Until today no other example of this model was found. The relevant literature mentions this weapon, but no detailed pictures have ever been shown. The MP38(L) field-stripped. The barrel with front sight, the bolt with recoil spring covered by a telescoping tube and the firing pin do not differ from the standard MP38. At the beginning of 1938 the Erfurter Maschinenfabrik (ERMA) received an official order for the development a new submachine gun from the Heereswaffenamt (office for army weapons). Already a few months later, at the beginning of June 1938, ERMA presented the “Maschinenpistole MP38”. This achievement is impressive, however the time interval seems to be much too short for developing such a new weapon. This fact must arouse suspicions that a (nearly) ready draft must have slumbered in the drawers of ERMA. And now the time had come to take it out. And actually, the MP38 wasn’t a complete new design by any means, but rather the advancement of a nearly unknown predecessor model: the EMP36. The predecessor of the MP38: The rare ERMA EMP36. The weightiest change, in the true sense of the word, concerned the manufacturing of the receiver. 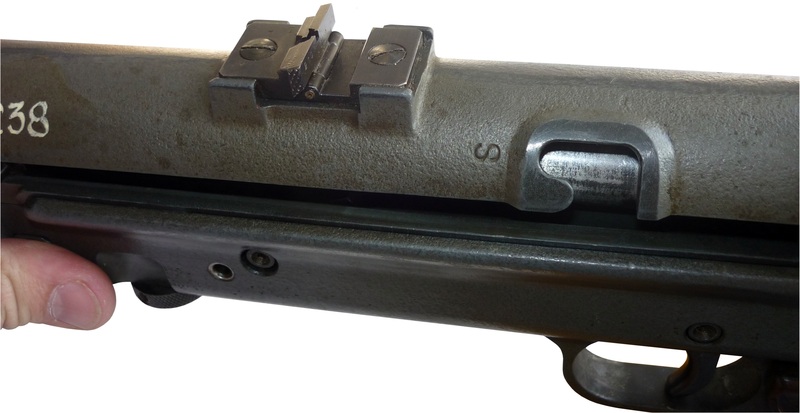 For reasons of weight reduction the solid steel receiver was provided with numerous oblong grooves and and the vertical magazine well got a large round cutout on each side. 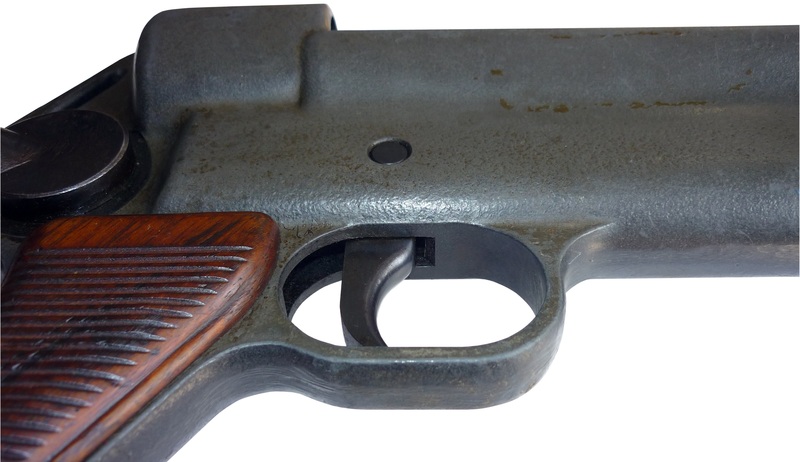 The lining of the receiver’s lower part of the EMP36 was completely made of wood, but with the MP38 the much lighter bakelite was used instead. At this time still a quite new material in the manufacturing of weapons. In addition the fire selector has been omitted. The revision was done in a short time. Only seven months later the MP38 was basically tested, followed by the official introduction on 29 June, 1938. Serial production started in July 1938, although very slowly. When Germany launched the attack on Poland (“Fall Weiss”), about 8700 MPs were listed in the inventory reports of the units. The distribution of the new weapon took place in a hurry with the result that there was no time for special field tests. So selected units had to send experience reports back continuously. German paratrooper with MP38 after the capture of the Crete island. Note the milled solid steel receiver with grooves for weight reduction. But the MP38 still was an expensive weapon to manufacture. In spring 1940 the company ERMA tried to simplify their design. 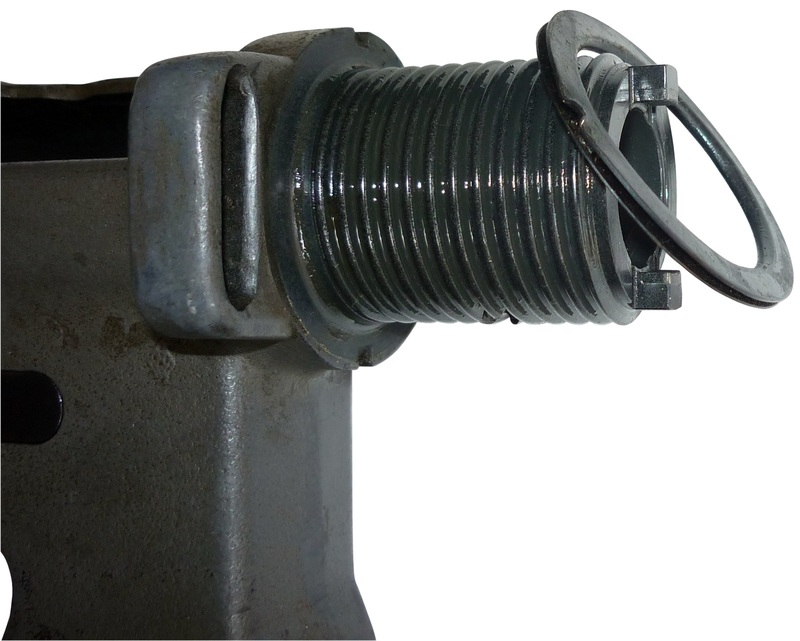 In the meantime the use of pressed sheet metal parts in the industry had made great progress and so the receiver and grip-piece were redesigned for this kind of technology. The new weapon was named “MP40” and serial production started in March 1940. 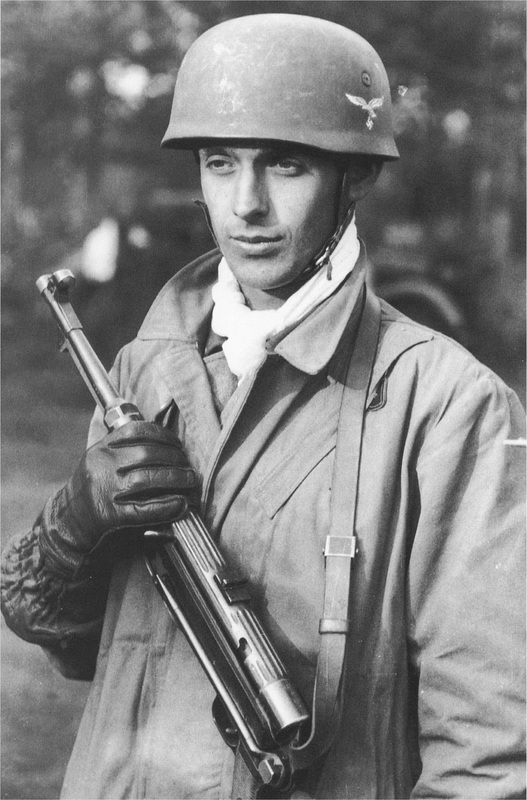 The MP38 stayed in service till the end of the war, but most of them were modified with an improved safety from the MP40. In this time experiments were carried out with a light-weight MP made of aluminum. No documents or other information could be found, so all that is left is the unique MP38(L) as a piece of evidence. The initiator of this development is still unknown. Some researchers think that the “L” stands for “Luftwaffe” (air force) and that the weapon was a development for the paratroopers, that were in need of light-weight infantry weapons. But the air force did not have enough influence on the arms industry at this stage of war and one should keep in mind that aluminum was a rare and expensive raw-material. Most of it was used in the aircraft industry and step by step the parts made of aluminum on military equipment were reduced to a minimum to avoid shortages. For logical reasons the “L” means “leicht” (light). With a weight of 3.34 kg (7.35 lb) the MP38(L) weights one kilogram less than the MP40. 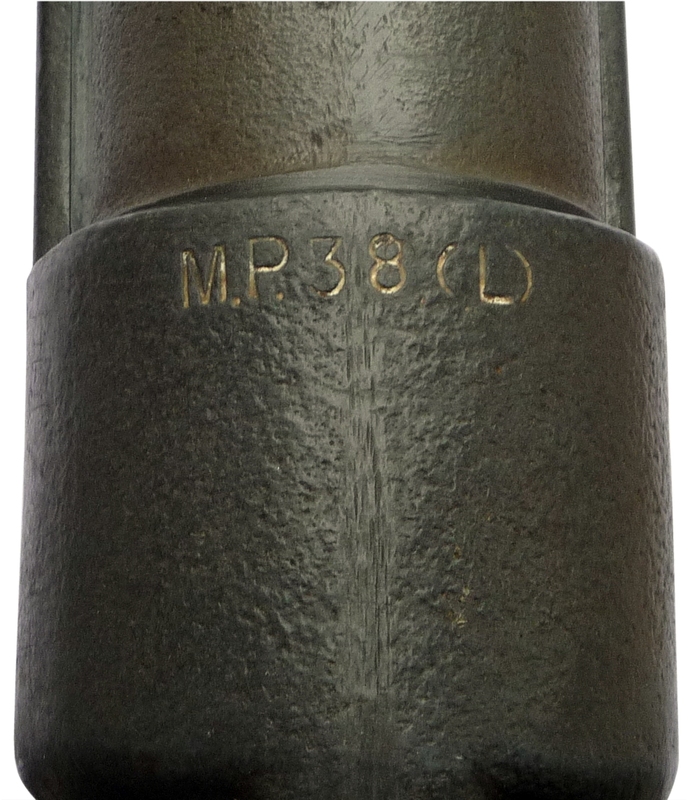 Marking “M.P.38 (L)” on the top rear of the receiver. Neither manufacturer nor date are mentioned. The military manufacturer code of ERMA is not put on the weapon. 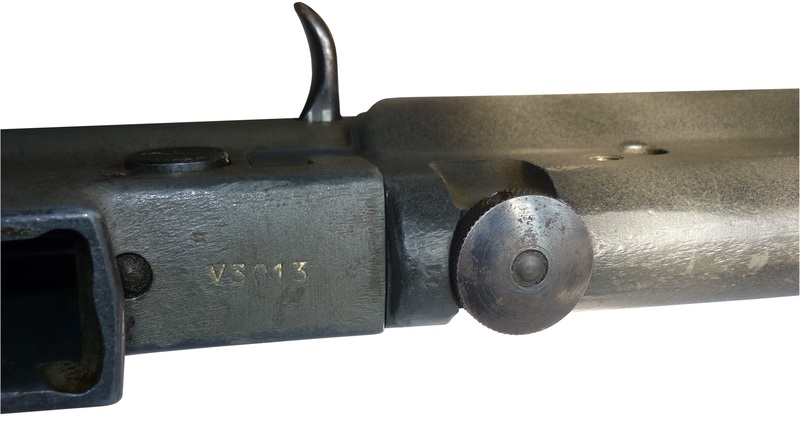 The only marking that connects the weapon with ERMA is the Waffenamt WaA280 found on some parts. Some other markings “EE in a circle” can stand for “ERMA Erfurt”. The cast upper and lower receiver are marked with a nearly not visible “AWW” logo. So this parts were made by the Aluminium-Werke Wutöschingen in southern Germany close to the Swiss border. The barrel-rest was made by NÜRAL (Nürnberger Aluminiumwerke / today Federal-Mogul). The Waffenamt WaA280 was used by ERMA. Also the marking “EE in circle” may stand for “ERMA Erfurt”. On the barrel the lowest line of the second “E” is nearly invisible. 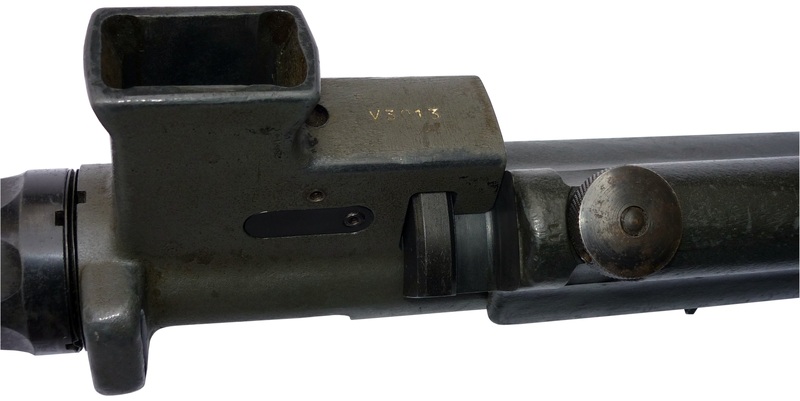 The marking “V3013” can be found on the underside of the receiver behind the magazine well. The “V” may stand for “Versuch” (experimental). 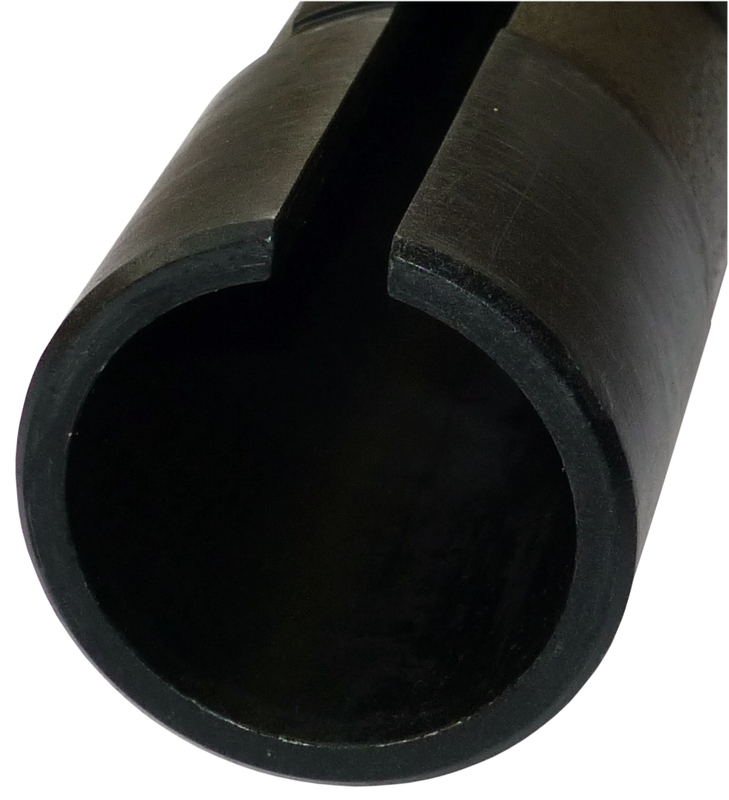 The receiver walls are 5 to 7 mm thick to be robust enough for combat. In difference to the MP38, which is only hold together by the spring-loaded button, the two receiver-parts of the MP38(L) additionally interlock with each other. 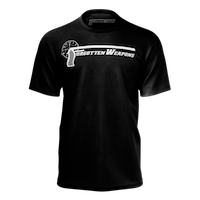 This design takes pressure of the point of connection when shooting the weapon. 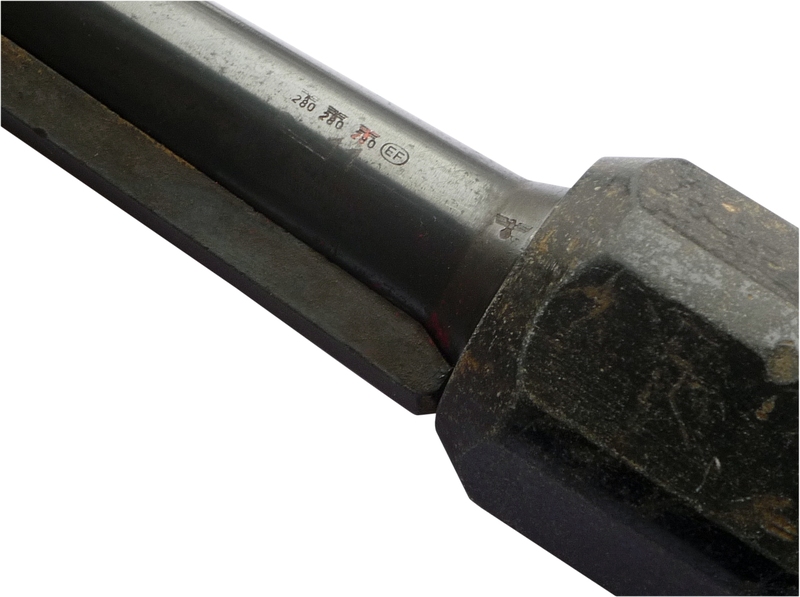 The thread for the barrel nut is not as fine as on the MP38. Below the sling-lug the logo “AWW” of the Aluminium works Wutöschingen is visible. The screwed-on rear sight has a fix notch for 100 meters and a flip-up notch for 200 meters. Around the hook-in cut-out for the cocking-handle the receiver is strengthened. The “S” means “Sicher” (safe). View inside the lower receiver showing the moving parts of the trigger mechanism. The receiver is cast of one piece and not embedded in wood or Bakelite. The trigger guard is cast of one piece together with the lower receiver. The author wants to thank Jan Skramoušský and the Military Museum Prague. The aluminum receiver is a casting. That means that a pattern was made specifically for this weapon, which is indicates preparations for mass production. I bet several of these little guns were made. o work out the details for production. 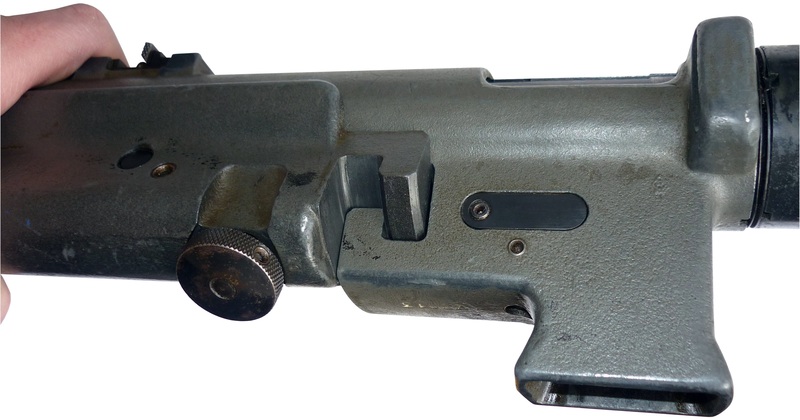 is the bottom part of a mp38 L with bakelite and aluminium grip. The waffenamt stamped on it is 280 code. On the upper part you can read mp38 but not too clear as it will have to be cleaned properly. Maybe some of you would be interested in some photos(?) and i don t know how to send them apart from an email adress.I am not good with computers,sorry. Fancy that. There’s a place in Las Vegas that has a full-auto MP40 you get to shoot in their machine gun package. If I saw an MP38 there, I would probably cry… The abuse it would receive! I was there couple of times many (oh, yes) years ago. May not be as extensive, when comes to small arms, as museums at Koblenz or Liege but it is still worth of visiting. Location is convenient since it is in square adjacent to Prague Castle. Could this weapon have been intended for Gebirgsjagers, who also used the similarly light-weight Gewehr 33/40 rifle, or possibly an Otto Skorzeny unit? I was going to say that if anyone on the FW site has actually laid eyes ( or even hands ) on the example in the Czechoslovak Military Museum in Prague, it would have to be either Denny, Leszek Erenfeicht or Max Popenker. You make me chuckle Earl…. When I was at mentioned museum, and it was more than once, I was just a youngster. Of course I had my eyes ‘on top of my head’ gazing at the guns thru glass. Those two gentlemen you mention, unlike me, have probably access rights. As I mention in previous, there are 2 major museums of this sort in Prague, one being as per this article and one in Schwarzenberg palace near Castle. The second one, at time of my visits was extensive and well staffed. It was more international in its orientation and it covered times from middle ages to WWII. Thanks for the information, Denny. I hope one day to spend some time in Prague as well as in the countryside, and both those museums would be on my list. Just to add; if there is a place I like to see in Europe it probably would be Les Invalides in Paris. My son visited there last year and according to what he told me he was very impressed. Than say Tower in London may come to consideration too. I read time ago that they have a gun there which was shooting square (literally) bullets. Round ones were used against fellow Christians, square against Turks. Me too, Denny, me too. I think the gun in question was the Puckle 1.25″ revolving-cylinder flintlock, which held eleven pre-loaded charges and was capable of 63 shots in seven minutes, or 9 rds. / min. in modern terms. The inventor of this early mechanical gun, one James Puckle ( 1667-1724 ), was a barrister-at-law and writer who happened to be an innovative gun designer as well. 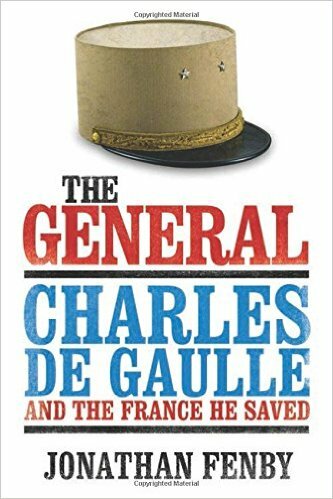 His view was that the square bullets, which were considered far more damaging to human targets than conventional round balls, would convince the Turks of the so-called “benefits of Christian civilization” — not an unusual attitude for the time, given the political situation in Europe and the Near East. Needless to say, the unpredictable and unstable ballistics of square bullets soon resulted in the demise of that concept. According to various sources, the two remaining genuine examples left are on display at Beaulieu Palace and at Boughton House, both former homes of the famous Montagu family. John Montagu, the Second Duke Of Montagu, who was Master-General Of Ordnance in England at the time ( 1740-1749 ), reportedly bought several Puckle guns for his expedition to capture the islands of St. Lucia and St. Vincent in the Caribbean. There was definitely one at Beaulieu in the 1980s. Haven’t been back since! Excellent recollection Earl! Yes it was mentioned Puckle gun; the article was in American Rifleman some 20-25 years ago and I was particularly amused with that “Turkish plan”. This was VERY inventive design for its time. I appreciate Editor lets us roam freely away from topic. I try to be modest in return, but it is hard to restrain self when comes to such lively discussion. Just shortly about subject ‘leicht’ MP-38; I like inventive drive behind it. But, to my critical eye it does not come with its appearance even close to its sheet metal/ machined cousin. Had they known today common ‘lost-wax’ cast technology, the result would have been likely lot better. Dang, Ian. The wonders never cease. Thank you again, Oh great moustached one! This article appeared in the french magazine GAZETTE DES ARMES for march .However the detail of the photos here is much better due to their size.Now if Michael would do an article about our local (Limoges)sten copy the GNOME et RHONE. By the way the GAZETTE DES ARMES has an idex page of articles worth looking at. A very interesting article on the MP38(L). I have a book on the MP38, MP40 and MP41 guns that contains a few pages on the MP36 and MP38(L). All good info. I have a MP40 with MP40, bnz 41 stamped on the rear of the receiver. All serial numbers match on the weapon including all small parts, even the front and rear sights. I have a spare bolt and recoil spring assembly that I install in the weapons’ receivers to replace the original bolt and receiver before I shoot the weapons. That way these original serial numbered moving parts don’t receive any ware and tear. I have other WWII auto weapons that I purchased nearly 60 years ago for a pitance compaired to what the same weapons are going for today. The MP40 and MP41 are my favorits though. I can’t believe today’s prices. I have played with that one while visiting the museum in Prague to photograph other stuff.. Very interesting. The museum itself is in Prague proper, but all the “extras” not on display are held in a giant building about an hour away from Prague. And today, a semi-auto reproduction of the MP-38 (L) is offered by Sport Systeme Dittrich, for civilian sales, in Germany, and elsewhere. They used that unique weapon, by studying and examining; thus, they reverse engineered and make a semi-auto replica. It’s production is limited, however, and it could cost more than the regular BD-38.